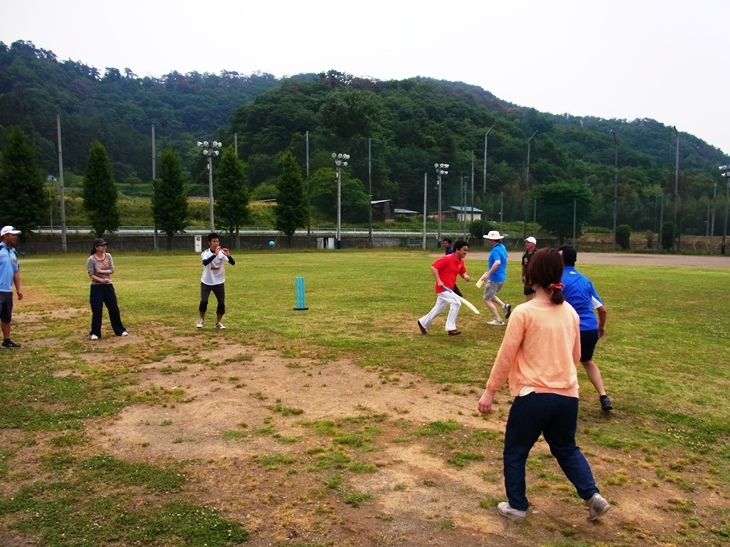 On Sunday, 25th May, fifteen or so cricket organizers and players assembled at the Tanuma ground for a JCA “Train the Trainers” event. 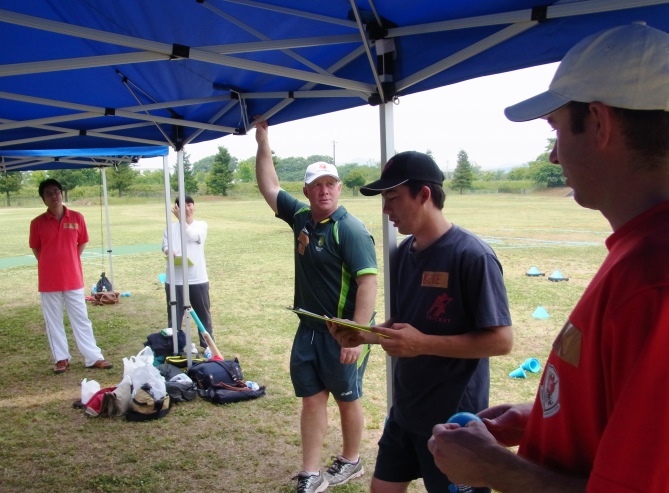 The session was run by Cricket Australia’s Cameron Tradell, or Cam for short, who came all the way from Australia to impart his knowledge and ideas on attracting young players to the game and improving skills across the board. Attending on behalf of the Sharks were Aditya, Dave L and Anton. Dhughal was there too as part of the JCA contingent. The day started off with some great catching drills for kids (that God knows the Sharks could use!) whereby we had to catch the ball in a small cone and then on (yes – ON!) a cone to promote the use of soft hands; so simple yet so effective. 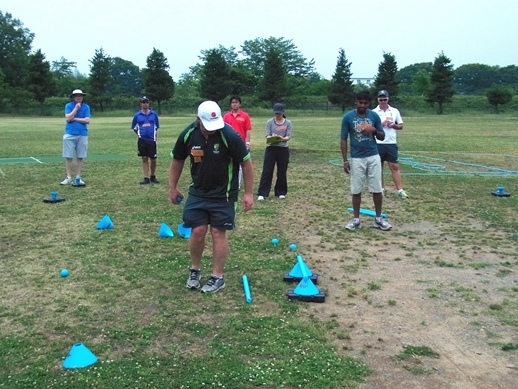 We then moved on to some fielding work focusing on accurate throwing; a stump was placed horizontally on a couple of cones, a metre in front of the wicket, the idea being to throw the ball under the horizontal stump and hit the wickets behind. 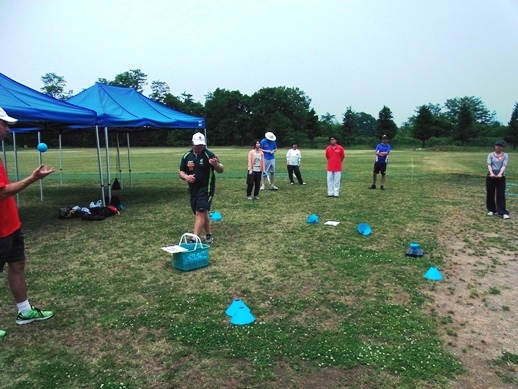 Cam then combined these skills into further drills culminating in a game in which the multiple skills were practiced; the ball was thrown up a line of fielders while the batsmen ran. The fielder at the end of the line then returned the ball to the keeper, trying to run out the batsmen in the process.What was clear was that all the activities were fun, focused on defined skills and directly relevant to the skills required on the pitch in a real cricket match. Then, in order to encourage the autonomy that coaches and trainers in Japan will need, the participants were put into three groups to devise mini training regimes for 3 skills which were then combined into a game at the end. Cam was always on hand to make suggestions and draw from his enormous mental bank of drills. It got everyone thinking about which skills were most in need of improving and how these could be practiced in simple activities that were easy to both comprehend and explain. The resulting three games were all innovative, fun and useful and will doubtless appear in some form on the Sharks training pitch or the warm up before a game. Many thanks to the Cameron Tradell for coming to Japan to give his clear insight and advice, and to the JCA for organizing the event, particularly Bebe who acted as translator the whole day and Makoto who helped out everywhere.